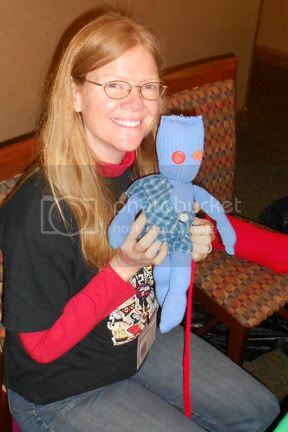 One of my favorite convention moments is the Sock Mac Feegle craft panel. We missed the first one because it was happening at the same time as our Terry Pratchett book plate signing, so we were anxious to make the other session and three names down the alternative waiting list. All day Friday and Saturday we saw others walking around with their adorable Feegles, which made us all the more excited about making them. We showed up early in hopes of getting an empty slot, and the lady running it told us to just go ahead and start working on it because she expected she’d have enough supplies – yay! Since we were first, we got the good scissors and the good thread! I think we got the fun table, too. I wish I had gotten people’s names. The father/son Mac Feegles I loved so much from the costume contest were at our table and regaled us with stories about their chat with Sir Terry. There was also a really funny lady who chatted the entire time she was there. She was teaching the boy Mac Feegle how to insult people – so that end of the table was a mess of “Your Face” comments because apparently that was the best way to begin any comeback. I’m still saying it a week later, so it must be true. 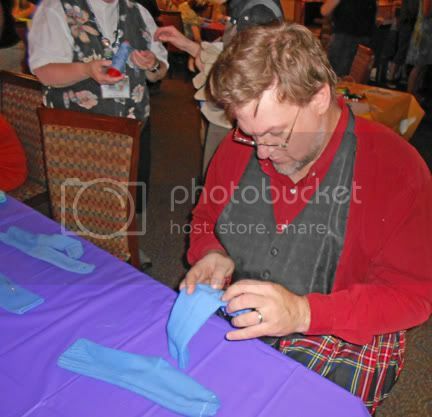 Our table was protective of the scissors. Others would come and borrow them temporarily, and we would make it clear they were going to return them. (Your face would return them.) It was kind of funny because we unconsciously took turns monitoring where the scissors were and checked in with each other to make sure we had our supplies. Note Monkeys wore his kilt for the project. 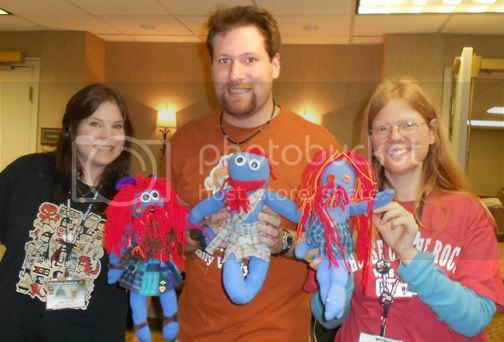 Most of us planned on starting the puppet but leaving a bit early to attend the Good Omens panel then return later to finish, so there was a kind of mad dash aspect to making the dolls trying to get as much done as possible in a short amount of time. And the poor lady running the panel was trying to walk from table to table to give instructions, but she kept getting interrupted, often by me, so most of our instructions came from consulting the others at the table. That was fun, too, because it became a group effort. After the Good Omens panel we returned to the craft room to finish our Feegles. There were people still there from before! Five young ladies who chatted jovially amongst themselves as they had been getting to know each other over yarn for over three hours at this point. They were hilarious in teenager ways – trying to explain the difference between North and South Dakota. Two of them lived in what sounded like a log cabin with no television, so they had some nontraditional stories to share. 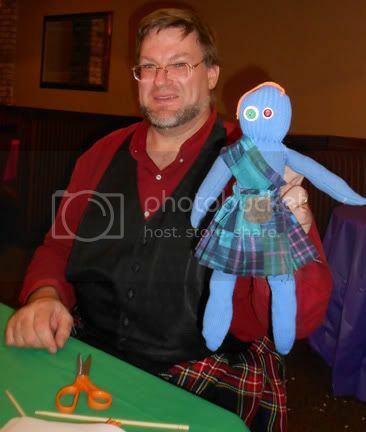 Since we weren’t participating in their conversation it gave Monkeys, Toast, and me time to concentrate on making kilts, sewing on button eyes, and figuring out how to do hair. Toast made rock star hair. Monkeys and I focused on kilts. Monkeys gave his a combover, which got a lot of laughs! The craft leader was super nice and let us take needles, yarn, threaders, and whatever else we wanted to finish our Feegles and even took pictures of our works in progress because she liked them so much. That was the best thing about the project – everyone’s was totally different and amazingly cute. You couldn’t make them wrong. If they had wonky hair or too short arms it just make them cuter. And if you put a lot of detail, time, and care into them (like Toaster did) you get a really impressive creation. Several people stopped her for a picture of hers! Toaster and I finished our Feegles in the hotel room that night. Eventually I want to take the kilt off and resew it with better pleats, but for the time we put into them I’m really pleased with mine. The next day we had other Feegles and their people want to pose with pictures together and exchange “ooo” comments, which was fun. Toaster and I decided we needed to host our own Sock Mac Feegle session for friends or at Dragoncon because the world needs more of these guys roaming around! My Feegle has eyes in the back of his head! Cuz I got mixed up when I first started sewing and attached them so firmly it was easier just to add new eyes to the front than to try to move them... He can keep watch. And you're right.. you can't do them wrong. Any mess-ups that happen only serve to make them cuter and more adorable. =o) Love love love!!! I am very belatedly starting to make my own Nac mac Feegle sock puppets (I was in line early for the Good Omens talk so I missed the instructions... but on Sunday I checked out some of the work that was done and I was really impressed (and inspired). I just now had some free time and I haven't been able to find light blue colored socks (only navy) but I'm loving my Feegles anyway. I just wanted to thank you for posting all this at your lj, it if very exciting to see!